Those who are six, 16, 64, and more have all kinds of great events in store for the National Education Association's nineteenth annual observance of NEA's Read Across America. NEA and Denton ISD are calling America's children, both young and old, to reward their learning by celebrating the joys of reading on Dr. Seuss's birthday. 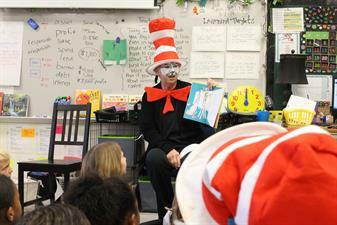 Denton ISD’s elementary schools will celebrate Read Across America on Friday, March 1. Volunteers are needed between the hours of 8:00 – 2:00 p.m., with a minimum time commitment of 30 minutes. To honor the good doctor and celebrate the fun and value of reading, Denton ISD is asking you to join other community volunteers in bringing a nation of readers together under one hat-the red and white stovepipe made famous by The Cat in the Hat-for a flurry (or furry) of reading excitement! To volunteer and brighten a child's day by reading to them and leading them in fun Seuss-inspired activities, sign up at: https://volunteersignup.org/9M7HD. Additional details will be emailed to volunteers closer to Read Across America. Remember to bring your photo identification (Driver's License or ID) to check in on the day of the event.